When scientists study a population in the wild, they don't want to disturb the animals too much. So how can you study an animal without capturing it? One way is by looking at their poop. Think about it. You spend 10 years in college and graduate school and what do you do? You go to the woods and collect poo. And it is really important work. Poop has DNA. And every individual has a unique set of DNA. This goes for people, chickens, fish, and most anything that doesn't reproduce by cloning. What this means is you can tell one tiger's poop from another's by looking at the DNA in it. So you can figure out how many different tigers (or any other land animal) are living in one place. You can also tell what bacteria or viruses an animal might have by looking for viral or bacterial DNA. Doing things like this, scientists figured out that there might be more pandas in the wild than they once thought. And from what group of wild chimpanzees HIV originated. All from DNA in poop. And this doesn't even mention other things scientists have learned. For example, grasses apparently evolved much sooner than scientists originally thought. How'd they figure this out? From grass in dinosaur poop (click here for more details). How many pandas are there anyway? Believe it or not, a lot of these problems can be solved by looking at an animal's poop. You may never see a panda but it will leave poop where it has been. And if the poop is fresh enough, the DNA can be looked at. As anyone who watches CSI knows, every person's DNA is unique (except identical twins). If you do enough testing, you can figure out the difference between two people's DNA. Same thing goes for pandas. What some Chinese scientists did was to collect a lot of fresh panda poop. 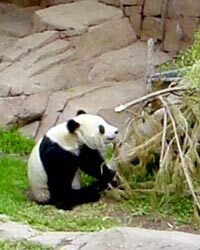 They got the DNA and made genetic profiles of each of the pandas in a reserve. Using conventional counting, scientists had estimated that around 32 pandas were living in the reserve. By studying DNA, the researchers concluded that somewhere between 66 and 72 pandas were actually there. More than twice as many as was previously thought. This is great news if it can be extrapolated to all of the estimated 1600 pandas thought to be alive in the wild. Notice the if. We don't know yet if the same thing will be true in other places. And while this is great news and good science, it is not cheap. It would be very difficult to do this for every endangered species. Imagine the outrage at scientists paying millions of dollars to collect and study an endangered lizard's poop. No, this will probably only be acceptable for cute, cuddly, high profile beasts like the panda. But still this is a great use for poop DNA. And may prove useful for other endangered animals as well. Where did the AIDS virus come from? AIDS seemed to appear out of nowhere at the beginning of the 1980's. After some work, scientists concluded that it originated somewhere in Africa. But why hadn't we seen it before? How does a virus just pop up and start wreaking havoc? One way a virus can just appear is when it jumps from one species to another. This is a big worry right now with the avian flu. Avian flu is a virus that is killing lots of birds and a few people right now. It isn't killing many people yet because it can't go from person to personyou can only get it from close contact with birds. The fear is that the virus might mutate and gain the ability to move from person to person. And the fear is a real one. Viruses mutate all the time. This is why we need a new flu vaccine every year and why HIV drugs can eventually stop working. In fact, the flu pandemic of 1918 may have arisen from a bird flu through mutation (click here for details). It looks like something similar might have happened with the virus that causes AIDS, HIV. 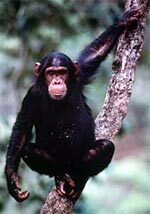 Apparently HIV arose from a virus found in chimpanzees called SIV. But no one has ever seen SIV in wild populations of chimps. So we couldn't be sure where exactly HIV came from. To solve this problem, a group of scientists set out to collect some chimpanzee poop and look for signs of the virus. What they found in southern Cameroon in Africa was poop that had SIV. And not just any SIV but a new strain that was much more similar to HIV than were other strains. By looking at all of the viruses studied to date, scientists have concluded that this is the virus that jumped to humans and became HIV. Most likely, someone ate SIV infected chimpanzee meat so that the virus was now in people. The virus mutated and could now move from person to person. The virus then made its way down the Sangha River to the Congo River to the city of Kinshasa. From there, the virus took off and spread across the world. We know all of this because of chimp poop. We can definitely learn a lot from what people and animals leave behind. We catch criminals because of fingerprints, blood, hair, etc. And now we can learn so much about animals from their feces. Yucky but cool.